For the 1959 model of the Škoda Felicia, see Škoda Felicia (1959-1964). 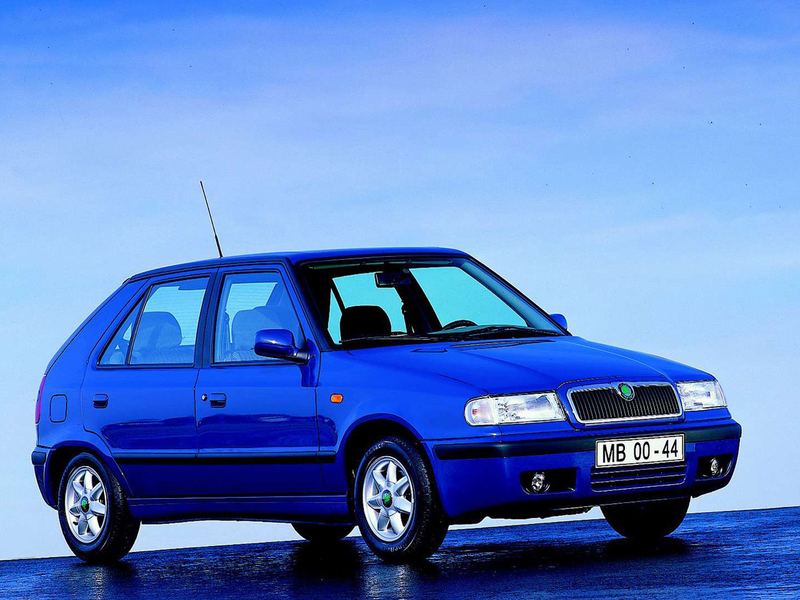 The Škoda Felicia, (Typ 791) is a supermini car produced by the Czech automaker Škoda Auto between 1994 and 2001. It was the last model on Škoda's own platform, but was one of the first models to benefit from Škoda Auto's takeover by the German company Volkswagen Group. The Felicia was a reworked version of the Favorit, but had a fresh, more modern appearance, with a redesigned front end and a wider range of engines. It was premiered in October 1994 on the Charles Bridge in Prague. 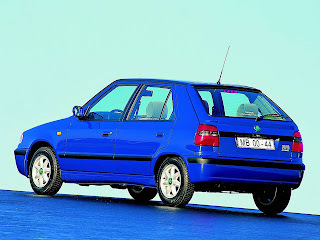 Serial production of the hatchback began in October 1994, the combi in June 1995, the pick-up in August 1995, and it ended in June 2001. The name Felicia was not used for the first time, resurrecting a nameplate originally used by Škoda in the 1960s for a range of two-seater sports cars. As the Felicia benefited from Volkswagen input, it helped to elevate Škoda's image in Western Europe. It heralded the first ever diesel-powered Škoda, and became their first car to feature major safety and convenience features. Some SLXi models featured air conditioning and velourupholstery. Anti-lock Braking System (ABS), drivers airbag, and seat belt tensioners were also available. In 1998, the Felicia made headlines after its high satisfaction score gave Škoda the "Best Manufacturer" accolade in that year's J.D. Power Car Survey. Production of the Felicia ceased at the end of June 2001, one year after the launch of the Fabia. A total of 1,416,939 cars had been made (the pick-up model was available for sale throughout 2001). The Felicia came in a variety of body styles, both for personal and professional use. The base model was a five-door hatchback, and from June 1995, was accompanied by an estate — replacing the Favorit-based Forman - now redubbed as the Felicia Combi (Typ 795). There was also acoupe utility version, the Felicia Pickup, (Typ 797) and a panel van called a Felicia VanPlus. The pick-up version was also imported to some countries re-branded as the VW Caddy pick-up. The pick-up model also had a lifestyle edition named the Felicia Fun, (Typ 796) conceived mostly for the Western European market. The rear screen section hinges out into the loadbay, allowing 2 extra seats to be folded out, giving comfortable seating for 4 adults. A tonneau cover is available to cover the rear seats, which are otherwise open to the elements. A Truckman top is also available which encloses the rear seats and loadbay, making for a more practical bad weather conversion. Luggage capacity in the hatchback was 272 litres with the rear seats in the upright position, and this increased to 976 litres with the rear seats folded. For the Combi (estate version), this was 447 and 1,366 litres respectively. In 1998, the Felicia and Felicia Combi received a minor facelift. The most obvious visual change was a redesigned radiator grille and larger bumpers, but changes also included minor upgrades to the chassis and bodyshell to improve crash safety. 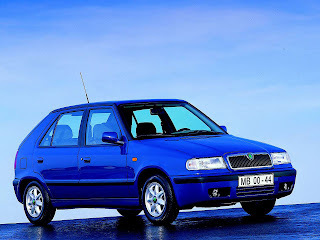 In April 1998, about three years after its launch onto the United Kingdom market, it made the headlines with an excellent rating in a Top Gear customer satisfaction survey for N-registered cars (sold from August 1995 to July 1996), and as the only Skoda-badged car sold in the United Kingdom for that period it saw the Skoda brand make headlines as the most satisfying brand of car to own. By the time British sales ended in late 2000, more than 76,000 had been sold, and by 2011 almost 30,000 examples were still registered on the road. All internal combustion engines used in Felicia are inline four cylinder designs, operate on the four-stroke cycle, are fuel injected, and water cooled. The fundamental layout of the Felicia'spowertrain included engines mounted at the front of the vehicle, and orientated transversely. The line-up included the old 1.3 litre overhead valve (OHV) Škoda petrol engines, now with Bosch MonoMotronic single-point fuel injection (up until 1997), and Siemens multi-point fuel injection, with two rated power outputs of 40 kilowatts (54 PS; 54 bhp) and 50 kW (68 PS; 67 bhp). There was also two engines sourced from Volkswagen Group: a 55 kilowatts (75 PS; 74 bhp) 1.6 litre petrol engine with Magneti Marelli multi-point fuel injection, and a 47 kilowatts (64 PS; 63 bhp) 1.9 D diesel engine. The 1.6 litre model served as a homologation basis for the Škoda Felicia Kit Car used in the World Rally Championship's F2 class. The only transmission was a five-speed manual gearbox, which was of a transaxle design, and contained the differential and final drive units. Drive was through the front wheels. Last updated on 7 May 2013 at 11:20.